My name is Dionie. I grew up in country NSW, studied accounting in Melbourne and then headed to London to do the work and travel thing like many of my friends.They all went home but I stayed on for 12 years. I met my South African husband while travelling in Croatia and four years ago, when our twin boys were 3, we moved to sunny Perth. I had worked full-time up until we moved so when we arrived I wanted to spend time with my boys before they started school. When that happened I was supposed to get a job but instead I got out my sewing machine and also decided to renovate our house. I am a Christian and that is at the crux of who I am. 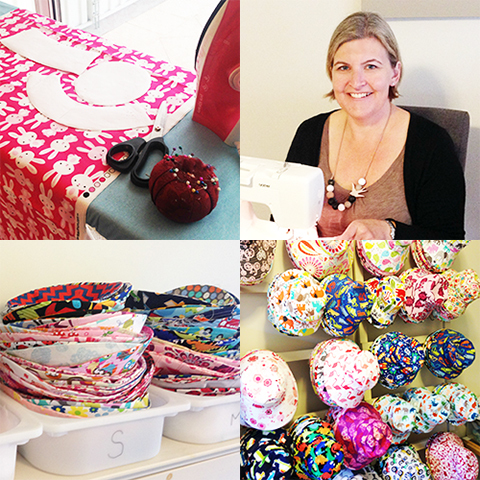 When I returned to Australia I fell in love with Amy Butler fabrics and started off sewing handbags from her fabrics. After making some hats for my boys and for a friends little girl I decided to make a few more and to see how they would go on my madeit store and at my first few market stalls. They sold quickly and so I fell into sewing more and more kids summer hats and fewer and fewer bags. I like to use bright and cheerful cotton fabrics for my kids hats - things that appeal to kids and make them want to wear a hat. Even though isn’t the reason I got into this, I am so pleased to be able to help kids get outdoors & keep safe in this sunny country of ours. Sometimes I see a must have piece of fabric and so still make some bags but I have also added a few other things to my store to round it out a bit during winter months when the demand for summer hats dies down a bit- ladies woollen cloche hats (think 1920’s), owl & penguin taggies for babies (which help use up my hat fabric scraps) and handpainted wooden signs from any reclaimed wooden fences or pallets I can get my hands on. For my hats most of my inspiration comes from the fabrics themselves or from kids. I look at the size of the print and the colours to see if they will work with the size and age range of the hat. I also try to find the best matching reverse- mostly dots and chevrons- but who knew there were so many shades of pink to try to match to? I think about what my boys would have liked at that age and what attracts kids at my market stall. I find that with my cloche hats a classic look works best- black and white being my favourite. For my signs the inspiration can come from the wood itself or the words- I like to use positive, upbeat sayings and Bible verses- something to bring a smile. If I find something works I tend to stick to it but I do spend alot of time on the internet trawling for new fabrics as they not only feed my fabric addiction, but also keep the monotony of sewing the same thing again and again fresh and new for me. I love getting a delivery of new fabrics to try out and I am always on the look out for a cute new saying to use. Getting lovely feedback from my customers and stories about how their children want to wear their hat everywhere, even to bed, keep me sewing and keep me smiling! For as long a I can remember I have either watched my Mum creating or we have done creative things together (and we still do) so it isn’t surprising I have continued on this path. I have tried many things over the years, confident to give something new a go. I even decorated my own wedding cake the day before the wedding- although looking back that was a somewhat stressful idea! As I started out making bags I wanted something that said sewing but also something that sounded appealing to buy. I had a few other ideas but similar things had already been used- pleatsandtreats just worked together so I went with that. Pinterest is a great time waster for me. I also like browsing fabric websites and the internet is great for tutorials. My Mum is still a great help whenever she is around and I also belong to a few facebook groups, including the madeit sellers group, which provide useful information and good advice. Listen to your customers. While I loved making bags and as lovely as everyone said they were, it didn’t mean that everyone wanted to buy one. But people did want to buy my hats so I changed direction. Then I got alot of queries about hats with straps and baby sizes so I added these. Just see what happens and you never know where it will lead you- but if you are going to do this, do something you love because it is hard work (especially if you are doing markets as well). After a rubbish market day where it rains or you don’t have any sales for a few weeks, if you aren’t doing something you love, these things will really get to you. But at the same time you can’t please everyone- some people want plain hats, some people say my price is too high, some people spend ages in conversation or messages but no sale eventuates- don’t get offended or upset when something like this happens because the next person who comes along may love my bright hats, may tell me my price is really reasonable and may end up buying several hats. Weigh up these things to see if you need to make a change but don’t let them get you down or stress you out. And don’t expect to make a fortune overnight- I’m not saying you can’t do really well in this business but it will take time to get your name out there and to build up a customer base. I’m not doing this out of love & I want to do well but I could never make & sell enough hats to replace my normal salary. It does however give me freedom to work around life and has so many other benefits. I love what I do and I am really starting to see the hard work pay off but success and wealth aren’t always measured by a monetary value so keep in mind why you are doing this. I have only had a small amount of advertising on Facebook and madeit so I haven’t really developed a strategy but I would say take advantage of anytime a product is featured on madeit (or any other medium) by putting it on your social media pages. People like to see that kind of thing and it also gets madeit and buying handmade out there. Hand out as many business cards as you can- you just don’t know where they will end up. Great products and good customer service will spread by word of mouth- and not so great products and bad customer service will spread even faster. Make sure your needle is sharp- a couple of times I have almost finished a hat only to find that I must have hit a pin along the way, my needle has gone blunt and I have some badly pulled threads so I need to start all over again. Also when setting up a special item/custom listing advise the customer that you don’t make such items until they have been paid for (unless you can add it to your general stock if it doesn’t end up being paid for). And add an expiry date on your custom listing or when you are liasing with the customer so there is no confusion about whether they really want the item or not. Travel has been a big part of my life and now I am enjoying exploring this amazing state of WA. I am blessed with some really fantastic friends who I love sharing a coffee or two and some laughs with and any spare time is used to try to finish off the last few things on my home renovation list. Music - pretty much anything really- from The Beatles to Birds of Tokyo, Rancid to Jesus Culture. But I do love a good disco song to get you dancing! Television Show - Having lived in the UK I love a great British drama- things like Downton Abbey or the recent Poldark series. I also like a good “who dunnit” and anything along the Selling Houses Australia/Location Location Location theme. Oh and sport- we love watching sport in our house- I think we would probably watch snails race if it was on. Film - 10 Things I Hate About You is still one of my favourites- rather than the movie itself I think it is probably more that the movie reminds me of certain friends & a fun time in my life, I really love the soundtrack and it made me realise that Shakespeare can be enjoyable. Book - The Bible - I don’t really don’t get time to read much else but I am a sucker for a glossy home magazine or two. A day with no housework, washing or cooking and where I don’t have to hear any squabbling or moaning from my kids would be perfect but until then breakfast at our favourite beach cafe, a stroll along the beach or around Kings Park (one of Perth’s greatest assets), some cardmaking/scrapbooking over a coffee with friends and watching my footy team win (it hasn’t happened much lately). Cute as a button - Absolutely gorgeous jewellery which gets lots of comments & fantastic service!